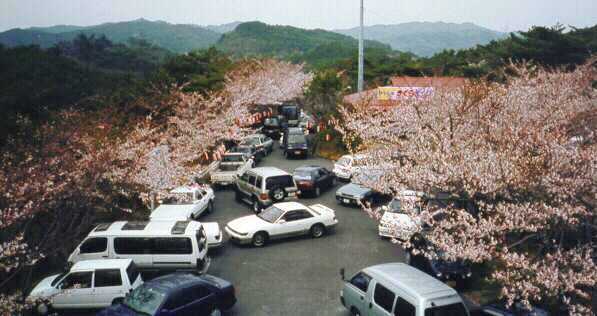 It is cherry blossom (Sakura) season in our area of Japan. There are colorful, fragrant trees blooming around all the parks, schools, hillsides, peoples "yards" (front yards are what in the states we would call postage stamps size) and almost anywhere you can go in the rural areas. Last Saturday we rode up (the operative word) to Ohama Koen (park). This is a small area with a wonderful lookout over the Pacific Ocean. 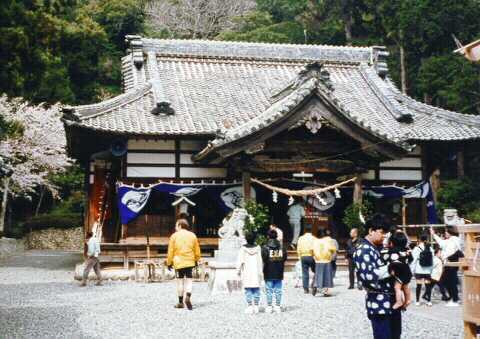 It is only a few kilometers from work and we often drive up there to eat a picnic lunch during the week. They have built a two-story platform structure so that you can see over the trees that surround this park area. It is constructed of concrete, but unless you look very closely you would think it was wood. They have formed the rails to look like tree limbs; complete with sections of stripped off bark, sawed off branches, etc. It somehow reminds me of Disney World, the way it can fool the senses. It was extremely busy at the park this weekend since the road up is lined with cherry trees, as is the small parking area. It was only 3/4 KM up the hill, but that took us UP almost 70 meters. Many people were walking up and as we passed they would say "Gambarre masho" (strive). At the top there was virtual gridlock of cars. There is only this one narrow road up and down and the parking area is not big enough to turn a car around once the perimeter is full of cars. I'm glad we did not drive up. It was really windy and we were almost the only ones to climb up the tower for the big view. It was also kind of hazy, so the view was not as good as usual. But the cherry trees were magnificent. 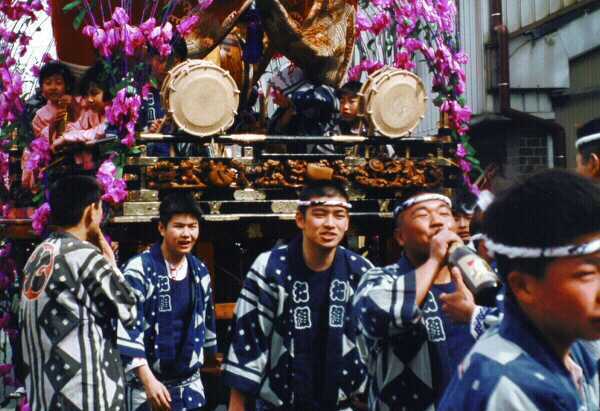 The tradition is to have drinking parties under the cherry trees, and many did. We, of course, had stopped for ice cream on the way and ate it on top of the lookout (in the wind). Definitely henna gaijin (strange foreigners). The ride down was almost as slow as the ride up due to the cars and people, but definitely easier! From there we went to a local festival. 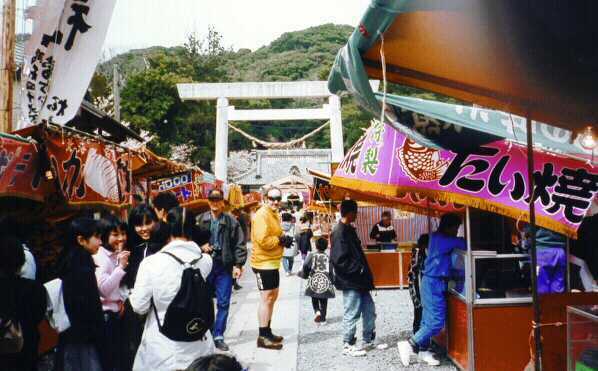 It was the "town" version of the harvest festivals of which I wrote back in October. Very similar, partying and pulling alcohol fueled carts around. Lindy got a roasted ear of corn (our first since being in Japan) at one of the stands for $4.00. To our taste, it was pretty bad, not sweet, and it was marinated in soy sauce. Very different. Due to the wind we decided to take the hill route home. It is a bad sign when we will climb hundreds of feet to avoid being out in the wind. So we climbed up towards the reservoir, turned left to climb up to the ridge that affords a view over both sides as you ride along and then went down the hill. The last stretch of downhill did not require any braking since we were heading into the wind. Sections where we would normally be coasting at 40 kph, we were pedaling at 25 kph, and working at it! Since we needed to pick up food for dinner (we have our priorities), at the base of the hill I headed toward the grocery side of town instead of home. At least I thought I did. I had turned one road too soon. Instead of heading northwest, we ended up going northeast and up a valley. 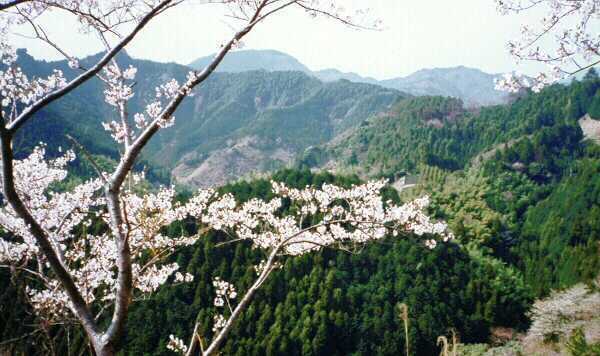 By the time we realized it, we were far enough up the valley that we figured we would keep going, after all, we were on a quest for cherry trees, and it was full of them. Another few kilometers and I knew where we were, and where we were headed. Up. This was a hill that we had done in the opposite direction in the fall. There would be a tunnel at the top and then a few sharp switchbacks to get down. Then along the river into the wind and UP. Another hill which we were very familiar with, only we always came down this one, never been up it in this direction. The top of this hill has a tall smokestack that is square. It is visible from quite far away (we can see it form our house). We refer to it as the "thermometer tower" since it looks very much like the tower in Corning, NY where they used to pull thermometer tubing. Well up and over and back in the flats, and the wind. It was terrible. We would struggle to go 12-14 kph (8-9 mph). All told, we did four hill climbs and fought valiant fights against the wind (Don Quixote comes to mind). We did more climbing in that day than we had since we climbed Awagatake last fall. Which brings us to what we did Tuesday. We took a half-day vacation to do the leisurely ride up Awagatake. This is a 529-meter climb up some really narrow roads. 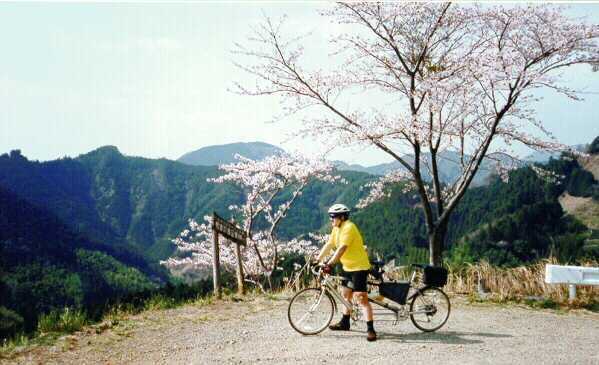 The roads have many cherry trees along them, and of course the local crop is tea. Planted in rows on slopes of up to 60 degrees. I have written about this climb as being the toughest ride we had ever done. This time we did a remote start, cutting out about 20 kilometers of local riding. We just did the "good" part. The ride started as a meandering easy climb along a river (stream) going through several small villages. By the river, the bird songs were of such intensity that they reminded us of jungle movies. We passed a group of old women playing "cage ball". It looks like croquet, but I don't know the rules etc. They all looked at us and laughed. A very typical reaction. At the 6-kilometer mark the real climb began. The toughest sections of the climb are at the end, and at this section. For the next 3/4-km we were in our 20x32 and struggling. There is a short tunnel we had to go through that made me a little nervous since it was not lit and we did not have any lights on. Fortunately, it is straight so we do get silhouetted against the other end. But no cars came through, so it did not matter. After this section the climb is a little easier, though we only get out of granny for one section later on. 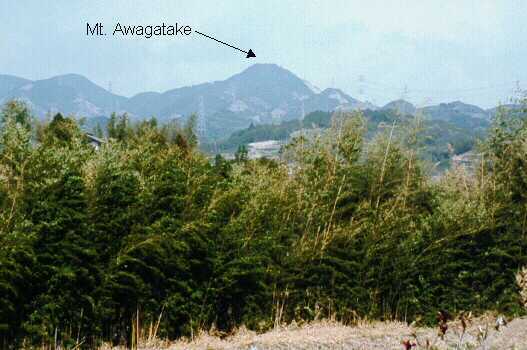 We passed some local farmers who asked if we were going to Awagatake. They of course told us "Gambatte" (strive). In a later section we passed a group of hikers on their way down. Some took our pictures, some said "hello", and some said "America?". Generally, people are very friendly to us. The last time we did this ride we had to stop at the bad switchback due to traffic and had trouble getting started again. This time we were able to turn the corner and kept going. Much better. But then the really steep section began. It was tough. There is a sheer drop off to the left (we ride on the left) with only a small guardrail. The road is so narrow that there are short sections (2-3 car lengths long) every couple of hundred meters that are wide enough for one car to wait while a car going the other way passes. We were given that courtesy a couple of times. As we rode up this section we would twist back and forth on the switchbacks. They were so steep that we could not detect the ones above us as we rode up, just all of a sudden there was a turn. These switchbacks had cherry tress lining them, such that they surrounded us: left, right, above, below. I am not sure if a large American sized car could go up this road. Finally the top. Last time we walked up the last 50 meters of tough to walk up hill. This time we powered up this section. Putting out a race finishing sprint effort we got our speed up to 7 kph!, and died. The long distance view was not up to par since it was hazy, but the local views on the way up were, as always, spectacular. 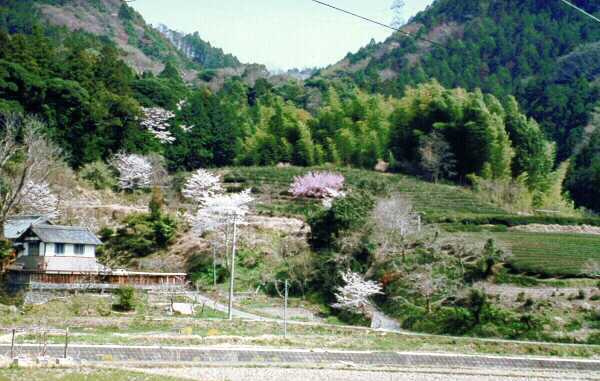 Hillsides covered with tea bushes, groves of cherry trees. There were also spectacular individual cherry trees that really stood out against the dark green background of tea bushes. 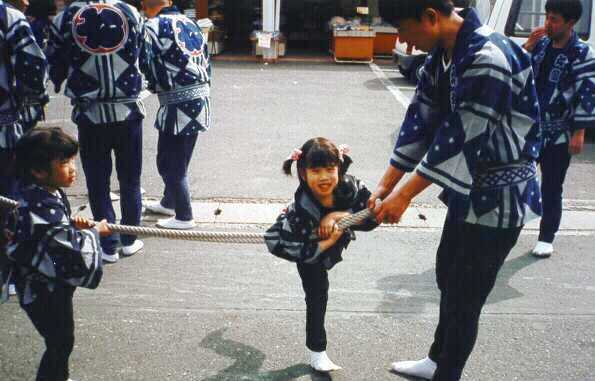 We spoke to several people with our very limited Nihon-go (Japanese). Generally we were able to answer their questions: where did we come from, where did we start the ride, how long did it take, isn't it difficult, why don't you use a motor, etc. There was one couple that was asking us questions but they just spoke too fast for us to understand. We were barely able to catch one or two words, so we just apologized. 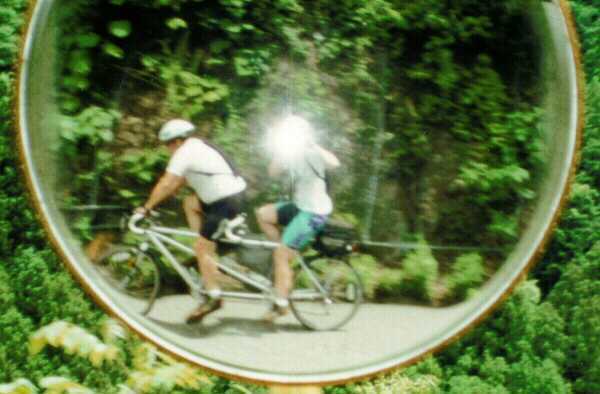 The ride down was 9 kilometers of 1/2 to full drum brake, plus speed modulation with the rim brakes. This is the type of hill that requires an auxiliary brake. In the curvy sections, I would not let the speed get up since we had to make such sharp turns and the sight line was quite limited. They do have those large convex mirrors at each turn so you can see around the bend, but it is tough. The last straightish section toward the bottom of the hill, after we went back through the tunnel, I let the bike go with only the drum brake on full. The drum could not keep the speed below 40 kph. I really would not want to try to come down a hill like that with only rim brakes. The climb was quite hard, but seemed much easier than the last time we did it. The fact that we did not have to ride to the start probably helped. 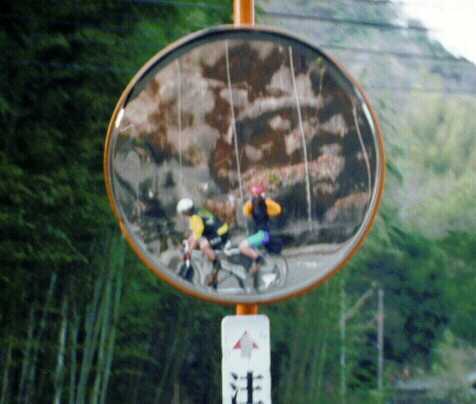 This is a beautiful time of year to be riding in this area of Japan. But the winds are fierce once again. We are told that this is a little unusual. At least we did not have Easter Sunday snow like the northeast US! We are just doing some easy riding today, but are planning to explore some new areas tomorrow. Another remote start to get us further into the hills north of where we live. We figure that if we drive the 10-km to get to the other side of the city that is north of us, we can ride much further. I'll let you know how it goes.